See also: Folding Curves, by Robert Geretschläger. When two developable surfaces contain the same curve, and that curve has the same geodesic curvature in every point in respect to the two surfaces, the planes tangent to the two surfaces form the same angle with the plane osculating at the curve, in all points thereof and are therefore either equal or symmetrical with respect to this plane. paperboard along a space curve, we obtain on both sides of the curve two developable surfaces having the forme property. If the first surface is known, the second is uniquely defined by the fact that it is the envelope of symmetric planes of the planes tangent to the first with respect to the osculating planes along the curve. 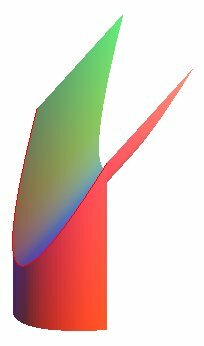 If the curve of the fold is generated by the point , and the generatrix of the first sheet is directed by , we obtain the director vector of the second sheet by calculating , , , where is the reflection with respect to the plane orthogonal to ; we have then . Example: if the fold is flat, the folded portion is the sheet symmetrical with respect to the plane thereof. 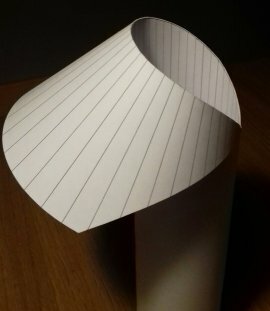 Opposite, case of a cone and of a parabolic cylinder. 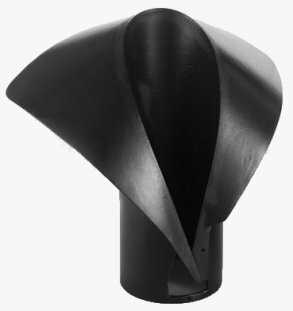 Cylinder , folding curve : . The generatrix of the folded part have as director vector : . For a plane fold : , : the folded part is the culinder of revolution symetrical with respect to the fold's plane. For a fold Viviani curve : , . For a fold pseudo-geodesic : , . By definition, the angle between the osculating plane and the plane tangent to one or the other surface is constant, equal to . Concrete experience with strong paper. On the right, gooseneck bagger. Mathematical modeling of the winding of the cylinder. The generatrix of the folded part here have a constant length, and do not model the rectangular paper sheet. Note that at the midpoint, the fold is flat, and therefore the folded part is the symmetrical half-cylinder. with t between and , u between 0 and 1, et the animation from = 0,001 to . Link to great achievements in folded virtual paper.